Under the support from the Ministry of Culture, the Museum has developed a digital collection management system which consists of two parts: "Collection Management System" and "Digital Knowledge Management System". This system aims for establishing a knowledge management platform of natural history, offering a digital knowledge-based database, which combines the information of research, collection, and education with web search function. In recent years, the NTM has implemented conservation and digitization projects for its collection. 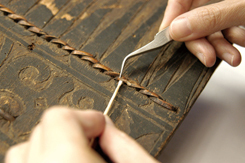 In 2003, the Conservation Studio was set up to use modern technology to preserve and conserve of the collection. Digitization plans are also being implemented. As a knowledge management platform for natural history, the Museum has set up the Digital Archive Project (http://irs.ntm.gov.tw/) that allows for more efficient collection management while making specimens more accessible to domestic and foreign researchers. This also makes up for real-world limitations on exhibition space and time, allowing many less-exhibited specimens to be viewed by the public.